Minishogi (5五将棋 gogo shōgi "5V chess" or "5x5 chess") is a modern variant of shogi (Japanese chess). Shigenobu Kusumoto of Osaka, Japan, invented or rediscovered the game c. 1970. 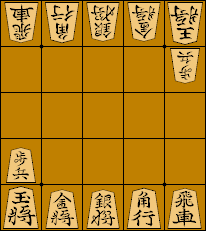 The rules are identical to those of standard shogi, except that it is played with a reduced number of pieces on a 5x5 board, and each player's promotion zone consists only of the rank farthest from the player. Two players play on a board ruled into a grid of 5 ranks (rows) by 5 files (columns). The squares are undifferentiated by marking or color. These are identical to the standard pieces of the same names. Each side places his pieces in the positions shown below, from the perspective of Black, pointing toward the opponent. The king is placed in the left corner file. The gold general is placed in the adjacent file to the king. The silver general is placed adjacent to the gold general. The bishop is placed adjacent to the silver general. The rook is placed in the right corner, adjacent to the bishop. That is, the first rank is |K|G|S|B|R|. In the second rank, each player places the pawn in the same file as the king. These are as in standard shogi, except that the promotion zone is the farthest rank away from you. Pieces promote as they do in shogi. You can drop like you do in shogi as well. The game ends whenever the same position with the same side to move and same pieces in hand occurs for the fourth time. In that case the side that started the game (sente) lost. (At least, these are the rules under which the UEC Cup for computers is played. Note this is different from regular shogi, where it would be a draw!) Unless the opponent was perpetually checking; in that case the checking side lost. Due to the small size of the board, the rook and bishop lose a significant amount of their relative strength in relation to the gold and silver generals. Because of the reduced ability for one to achieve king safety, threats of checkmate is always present, and having pieces on hand presents many checkmate threats which reduce ones' opponent's mobility. This must be balanced against the defense of one's own king by friendly pieces on the board. As in most variants of chess, a sound strategy is to develop less powerful pieces (gold and silver generals) before more powerful pieces (rooks and bishops). The traditional handicaps of rook, bishop, and 2-piece handicap in Shogi may be applied to this game. Additionally, there exists 3-piece, 4-piece, and naked king handicaps. In a handicap game of naked king, black may theoretically force a mate in 8 plies. Minishogi is also popular under artificial-intelligence researchers, and there are many strong programs that play it. Due to Minishogi being smaller, it can play a much stronger game than on the standard board size and piece count. Several tournaments in which such programs can enter to compete against each other are organized yearly, often associated with scientific conferences. The most prestigious of these tournaments is the UEC Cup, organized by the University of Electro-Communication in Tokyo. Other such events are TAAI (in Taiwan) and the ICGA Computer Olympiad. Minishogi can use the same standard protocols as regular Shogi for communicating between graphical interfaces (which display a Shogi board) and the artificial intelligence modules ('engines'), such as USI (Universal Shogi Interface) or XBoard protocol. There are several free strong Minishogi engines that can be used with the WinBoard interface, which supports both XBoard protocol and USI.